There are many reasons to choose a city to live in, but most of them revolve around our basic needs: employment, cultural stimulation and education. But sooner or later, we all need healthcare, whether it’s a routine doctor’s visit or a trip to the emergency room. SmartAsset set out to find the cities that are getting the best healthcare for the cost of their home. This is basically who has the most access to healthcare and is paying the least to be close to it. To determine this, we added the number of primary care physicians and hospital beds per 100,000 people (gathered from the Dartmouth Atlas of Health Care), and divided that by the median sales price in thousands of dollars in that city. This gave us an average measure of healthcare access per $1,000 of home price. We then ranked the cities by this number. 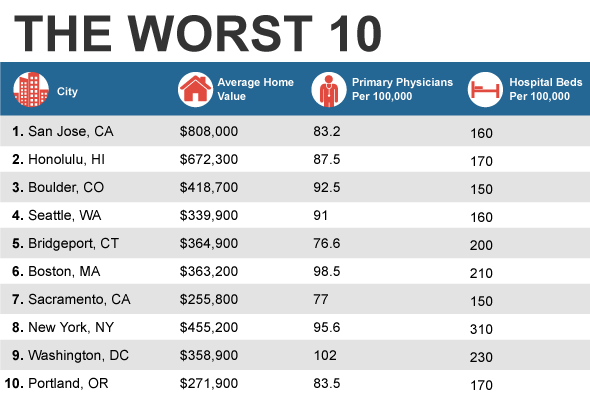 The average US city had $175,883 as the median home cost, with 70.442 doctors and 250.410 hospital beds per 100,000 people, for an access figure of 2.202. Some broad conclusions came through: Smaller cities with lower than average property costs, especially if they were college towns with or near medical schools, afforded easier healthcare access for your price than larger cities. This usually had to do with both higher property values in larger cities as well as lower numbers of hospital beds. 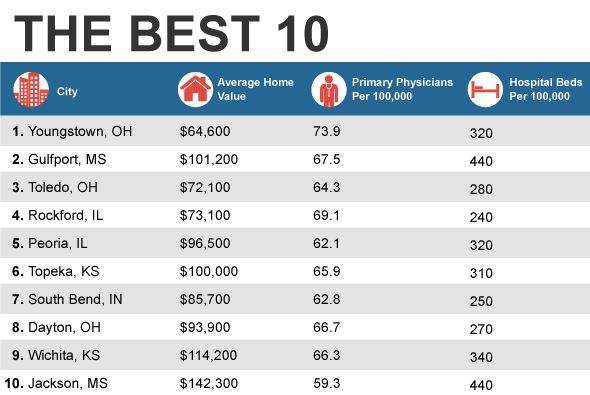 Although former steel town Youngstown only has a slightly above-average ratio of physicians to the population at large, its abundance of hospital space and lower-cost homes than most of the country means every dollar pays for significantly more access to healthcare than the nearest runner-up. It seems to be easier for a smallish city like Youngstown (population about 67,000) to sustain a healthcare infrastructure than a much larger one. 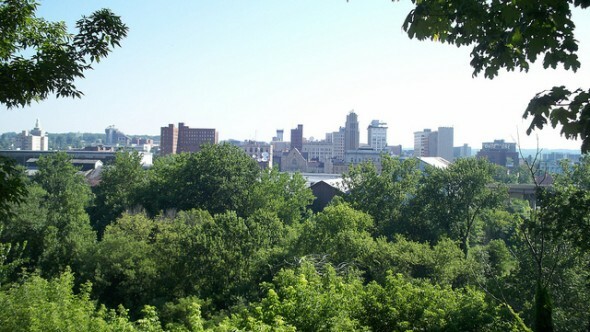 Youngstown also benefits from the presence of Youngstown State University, a relatively large state college with 15,000 students, to provide nurses, lab techs and other trained health workers to support its doctors. The second largest city in Mississippi, Gulfport is about the same size as Youngstown. Though it has a close-to-average number of physicians per capita, it has almost twice the average number of hospital beds. Gulfport has access to the resources of the large Navy ship compositing center there. The city’s major hospital also employs close to 3,000 people. Situated in northwestern Ohio along the Michigan border, Toledo’s 287,208 people make it the fourth-largest city in the state. Though its number of physicians per capita as well hospital beds per capita are just on par with the average figures, with its number of physicians slightly below and hospital beds slightly above average, its affordable property values mean residents get more healthcare access for their money on average. Toledo is notably home to much of the country’s glass and auto parts industries, as well as the oldest continually operating minor league baseball team, the Toledo Mud Hens. Rockford’s more than 150,000 people benefit in terms of healthcare from a satellite campus of the University of Illinois College of Medicine located there, which means more newly minted doctors may work in the area. The so-called “Forest City” also has a small private college, the University of Rockford, which has hundreds of students in its nursing department. Peoria is the oldest European settlement in Illinois. The title of second-largest city in the state (after Chicago) has gone back and forth between Rockford and Peoria in the past. Peoria, like Rockford, has a University of Illinois College of Medicine campus with more than 1,500 students and staff, as well as two major hospitals, OSF Saint Francis and UnityPoint-Methodist. An unusually high number of musical theater composers and lyricists have come from Peoria, including Shirley Temple collaborator Richard Whiting. The headquarters of construction equipment giant Caterpillar is also located in Peoria. Find out now: Which neighborhood is best for me? Topeka, the Kansas capital, is known for historical civil rights efforts such as Brown vs. Board of Education Supreme Court verdict, which declared segregation in public schools unconstitutional. Topeka has two major hospitals, Stormont-Vail and Saint Francis, as well as a Department of Veterans Affairs military medical center, accounting for the city’s larger than average number of hospital beds per capita. A private Methodist college, Baker University, maintains its School of Nursing in Topeka. South Bend is the surrounding community of the University of Notre Dame, which is located in an unincorporated area just to the north. Health care is the top industry in South Bend aside from higher education, with the Memorial Health System hospitals employing 4,000 people and Saint Joseph Regional Medical Center having about 2,500 employees. The Wright Brothers, inventors of powered aircraft, are among the numerous technological pioneers who hailed from the Dayton area. The top employer in Dayton is Premier Health Partners, which operates the city’s major hospitals and boasts a staff of more than 14,000. Miami Valley Hospital and Kettering Medical Center are among the Dayton hospitals that have received high marks from US News and World Report and HealthGrades’ national rankings in recent years. Wichita is one of the major aeronautics industry cities in the United States, and boasts the nickname “Air Capital of the World.” Both the 14,000-student public University of Wichita and the University of Kansas School of Medicine operate in Wichita. The capital of, and largest city in, Mississippi, Jackson is something of a college town, with about a dozen institutes of higher education. Jackson also has one of the highest numbers of hospital beds per capita in the country. West Coast cultural capital Portland is known for its well-regarded food and music scenes, but its health care value is hamstrung by the significantly lower-than-average number of hospital beds per capita, along with very high property values. There’s no denying our nation’s capital has a lot of sites of interest – a lot of history is preserved there – as well as a lot of doctors, with the greatest number of physicians per capita in the country. However, there are not as many hospital beds as the average, and median home values are above $350,000. Many Big Apple hospitals are regarded as among the best in the country, and some of them are even nationally household names. But despite a greater access to both doctors and hospitals than average, New York’s property values mean owning a home there means paying for significantly less access to healthcare for your money than elsewhere. The UC Davis Medical Center, located in Sacramento, is a renowned research hospital – but it’s the only major hospital in the California capital built on gold prospecting. Residents’ healthcare access suffers because of this, with one of the lowest numbers of hospital beds per capita among major cities in the country. It’s hard to think Beantown, home of Boston Medical Center and Massachusetts General, among other notable hospitals, would be a place with low healthcare accessibility, and yet it has lower hospital beds per capita than the national average. Connecticut’s largest city by population, and a center of the insurance industry, Bridgeport has two major hospitals but only about 80 percent of the average number of hospital beds per capita. The Emerald City may be home to major corporations in a number of industries, but hospitals aren’t one of those major employers – it has one of the lowest numbers of hospital beds per capita among major US cities. Rocky Mountain city Boulder is the home of the University of Colorado, the largest institute of higher education in the state with more than 31,000 students, including its medical school. This accounts for the greater than average number of doctors per capita in Boulder, but it, like many of the other entries on the bottom ten, suffers from a lack of hospital beds. Honolulu may benefit from beautiful climate and the cultural treasures of the Hawaiian people, but the Hawaiian Islands’ isolation from any other land means many resources have to be expensively imported, and the isolation makes access to healthcare relatively scarce as well. San Jose is the heart of Silicon Valley, and all of the tech money concentrated in the area accounts for the absurdly high property values – the median home costs $808,000. But although that amount buys more doctors per capita in the area than average, there are also much fewer hospital beds than the average available. Read the 2015 version of SmartAsset’s healthcare access and home affordability study.